Devoted husband to Millie (Hauser) for 62 years passed away peacefully on February 1, 2019. Jim was the proud father of five daughters: Diane Vey, Debbie Foster, Denise (Glenn) Schultz, Doreen (Carlos) Lopes and Dawn (Steve) Sericati; Wise Grandfather of Justin (Abbie), Adam (Lindsay), Thomas and Charlie Schultz; Nathan (Ann) Vey, Rachel Reichow, Leya and Marcelo Lopes, Dominick Sericati; Great-Grandfather to Samantha and Derek Schultz and Landon Vey; Brother to Barbara (Jim) Zavadil and Donna (Mark) Naus. He was especially appreciative of close family friends Karen VanBeek and Wally Baatz. Jim was preceded in death by his mother, Norma (Wettstein); father, Raymond; and daughter, Debbie. 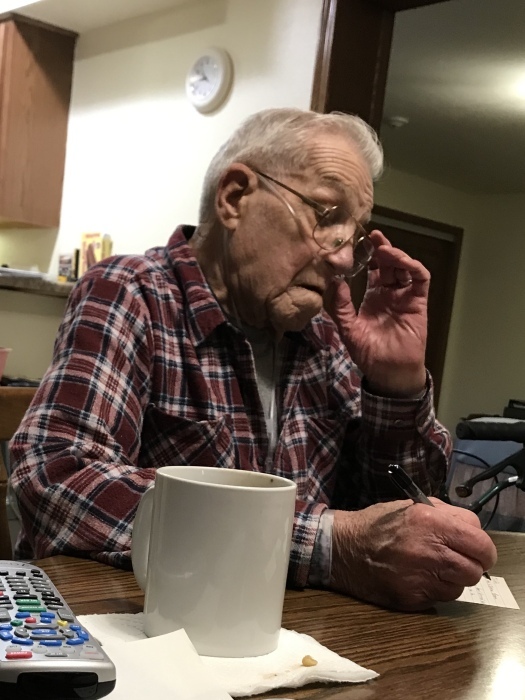 Jim was a member of the International Brotherhood of Electrical Workers since 1954, following in his father’s footsteps as an electrician and Business Manager of the I.B.E.W. Local Union 494 in Milwaukee from 1971 – 1983. As a boy, he enjoyed working summers on his (Wettstein) family farm in Webeno, Wisconsin. He continued to share those stories and lessons he learned through his final days. Jim was an outdoorsman and gardener, who passed his love and appreciation of the Earth, Nature, and the benefits of fresh air and hard work to his daughters and grandchildren. The family would like to thank the staff at Jackson Crossing, Horizon Home Care and Hospice and Kathy Hospice. Jim chose to spend his final days quietly with family and requested no public memorial service. Please remember him in your own way as a very special man, leader and beloved father. He will be missed. The Myrhum Patten Miller & Kietzer Funeral Home of West Bend has been entrusted with Jim’s arrangements. Additional information and guest book may be found at www.myrhum-patten.com.